…of a white Christmas! Greetings from the Northcountry! I’m currently spending some pre-holiday time in upstate NY, where the high today reached a balmy 9 degrees. While it’s a far cry from the warm southern air I’ve grown accustomed to, I very much enjoy the beautiful snow that has blanketed the area and most importantly, spending time with family. 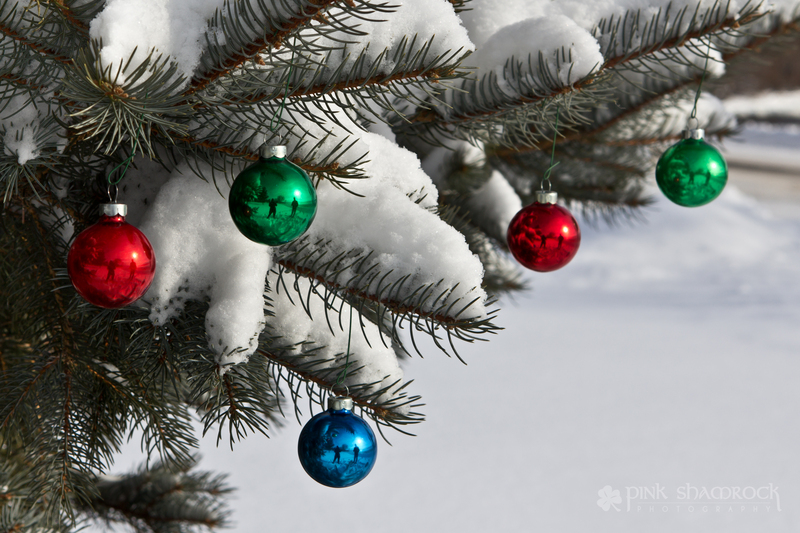 “White Christmas” – Ornaments hang from snow-covered evergreen branches. I should mention that this image was inspired by this image over at CJ Schmit Photography. Hopefully he won’t mind that I “borrowed” his idea! They say imitation is the most sincere form of flattery, right?! 😉 Next time I’ll be as smart as he is and use ornaments that don’t show our reflections! This entry was posted in Landscape, Personal, Photo of the Day, Seasons, Winter and tagged christmas, Erin Duke, evergreen, holiday, holidays, New York, NY, ornament, photo of the day, Photography, photos, Pink Shamrock Photography, Snow, tree, upstate, winter. Bookmark the permalink. Have a great holiday Erin. I actually like seeing the reflections in the ornaments.